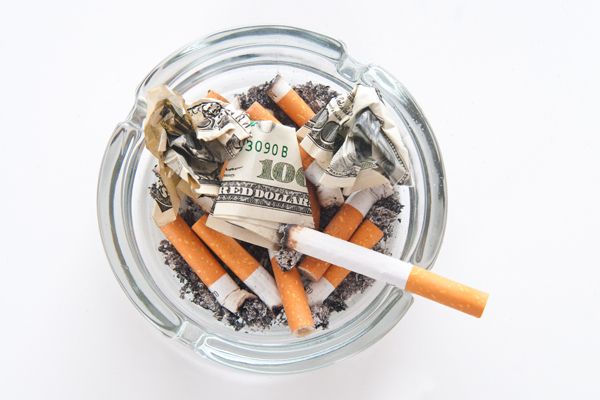 The tobacco company Reynolds American announced this week that its full-time employees will receive a one-time bonus of $1,000 in the wake of a sharp reduction in its British parent company’s tax bill. Reynolds’ bonus announcement comes after a much-less-heralded announcement by British American Tobacco, that it enjoyed a one-time tax cut of 9.6 billion pounds ($13.3 billion at current exchange rates) from the new tax law. When BAT completed its takeover of Reynolds, it also acquired the company’s huge stack of unpaid federal income tax bills. Reynolds’ last annual report before being acquired, covering tax year 2016, estimates that its deferred tax liabilities totaled $11.6 billion. These deferred tax liabilities amounted to IOU’s to the federal government. But since Reynolds calculated this huge IOU using the previous 35 percent corporate tax rate, the size of the IOU shrank substantially when the new tax law dropped the corporate rate from 35 to 21 percent. Whatever Americans think of Representative Nancy Pelosi’s metaphorical choices in describing the new tax law’s unfairness, her description captures the essence of the plan’s big giveaway to corporate shareholders. The collective $4.5 million that Reynolds’ U.S. workers will receive—once—in the wake of the tax cut will not assuage the fact that the U.S. Treasury will never collect $13.3 billion in income taxes that Reynolds once owed. American workers, including Reynolds employees, will ultimately bear the burden of this big corporate windfall down the road.